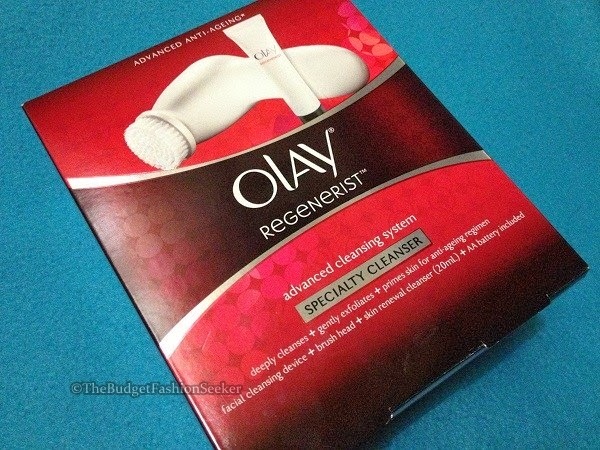 I was buying some grocery items from Rustan's Supermarket when a saleslady approached me and offered me one of Olay's latest product: Specialty Cleansel under their Regenerist line. 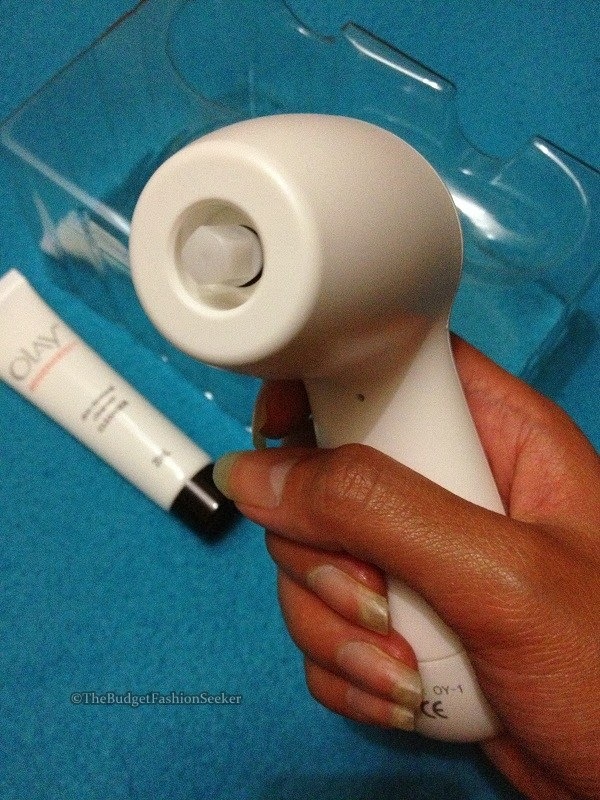 I haven't tried any Olay product in the past so I am not really interested to buy one at first. But then when she mentioned the discounted price to me, which that time was only Php399.00, I thought that it is already a good deal already. I think I even did another round, picking other things from my to-buy list until I decided to get one. And after three weeks of using the cleanser (I just use the brush once in a while), I saw some improvements with the current condition of my skin. It may not be that visible in my photos (I normally use my mobile phone for the outfit shots posted here), but I have lots pimples on my face that I am battling for two years already. Yes, I acquired the so called severe adult acne just a couple of years ago, which i never experienced as a student. I am not saying that I have smooth skin, but it never gave me a reason to panic and consult a dermatologist since it was spreading all over my face that time. I think the current condition of my skin is more tolerable (or maybe I just happen to accept that it may still take a long time to go back to the way it was before haha!). And I wanted to try this cleanser for a longer time to see if it can solve my dilemma. 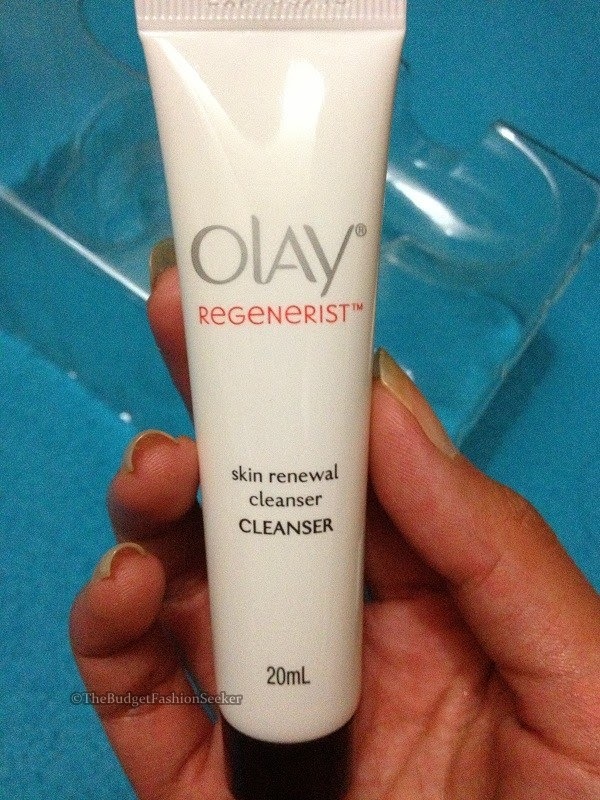 The only sad part is that this cleanser is still not available in the Philippines, as per the saleslady at Olay's section of SM Department Store. They offered me a cream cleanser instead. But that product will be discussed on a separate post. This is how the specialty cleanser is packaged and below are the contents that you will see inside: battery-operated brush (micro fiber), 20ml skin renewal cleanser, and 2 AA batteries. the head of the brush is actually replaceable and you can buy them separately for Php349.00 for 2 pieces. As for my review of the brush, it is really easy to operate since it only has 2 buttons, 1 for the power and 1 for controlling the speed. I also had an impression that the brush is painful on the face but it turned out that it is soft enough that you just want to take your time to massage your entire face. I just don't use it regularly since I go home late and I end up being lazy to operate a machine instead of just using my two hands haha! Although if you are wearing makeup daily, I think it will be advisable to use the brush since I noticed that there are less makeup residue found on the cotton upon using toner than just doing regular washing of face with hands. But like what I said earlier, it was the renewal cleanser that I fell in love with. It comes with exfoliating beads and it doesn't dry my face after washing. And the main reason that I want to repurchase is the fact that it gives me good result in terms of the condition of my skin. I am really hoping that I get the same result with the cream cleanser since that will be the product I am going to use starting today (I already emptied the 20ml cleanser). I will schedule a post about that after 3 weeks as well. I am not sure if I will repurchase another battery-operated brush when this one gives up since the original price is actually Php1399.00. Is there anyone here who are into Olay products? My next goal is to look for reviews on their creams and serums to know if it will be worth buying given my skin type. I will really appreciate it if you could share some stories/experiences that you had when you used any of their products (even if not under Regenerist line). By the way, I already picked a winner last night for my Christmas Giveaway! 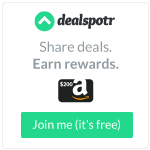 It was my first time to try Rafflecopter and I didn't know that it is just easy to use. I hope I can have another giveaway soon to show my gratitude for all of you who keep on visiting my simple blog. To everyone who joined my giveaway, thank you so much for supporting me on this one! 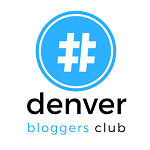 I was really afraid that no one would join this initially, but you've all been very kind to me. Hopefully I can do another one soon. Enjoy the rest of the day! uy! i wanna try! sana available na sya dito sa area namen. 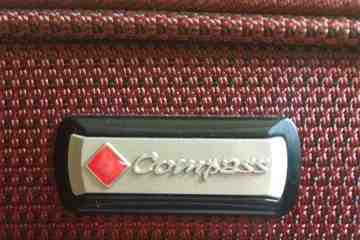 ;) thanks for sharing sis! 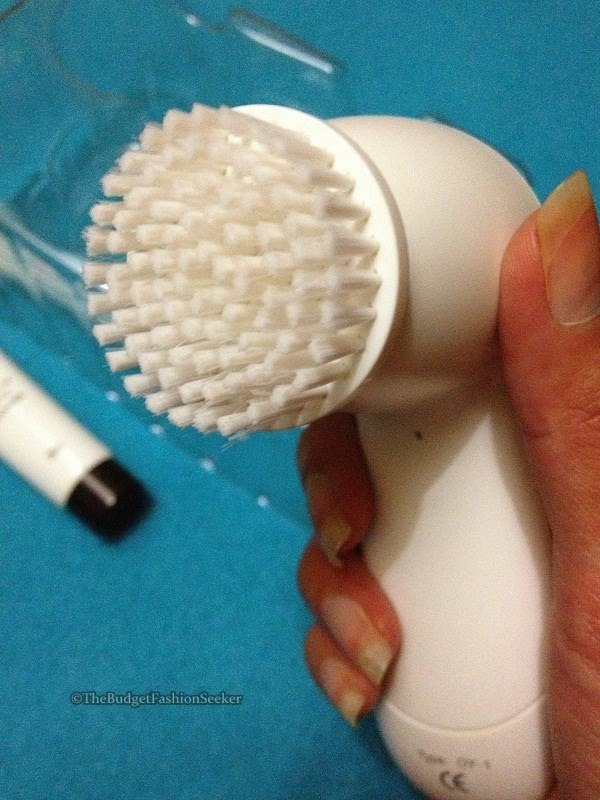 I like to try that cleanser brush, been looking for a dupe for the Clarisonic Mia which beauty bloggers have been raving about. I hope it is still on sale. Wow.. COngratulations.. and that Is really cool huh,,hmm..! Parang ang sarap sa fez! 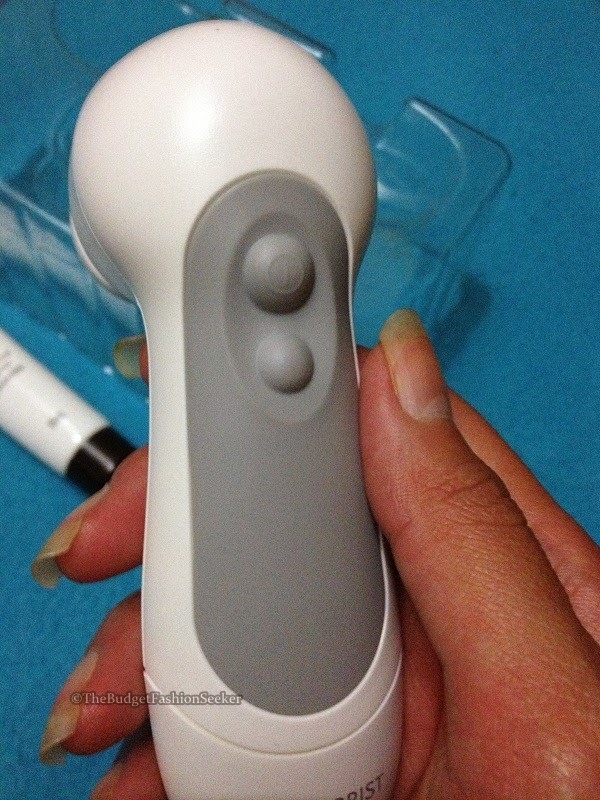 Looks like Clarisonic Mia, but definitely more affordable. Interesting. I have adult acne too, and I still don't know what to do with my face to clear it up. Gaaaaah! I have the brush and I like it. But when I brush my face, I don't press it in. I place it just so it touches my face ever so slightly. Pang-polish lang and pang-tagal ng flakes (due to acne creams). I use it only once every 2 to 3 weeks, kapag feel ko na di na kaya ng finger massage yung roughness.